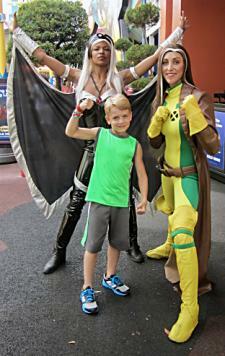 The X-Men are popular comic book characters that have also appeared in cartoons and movies over the years. 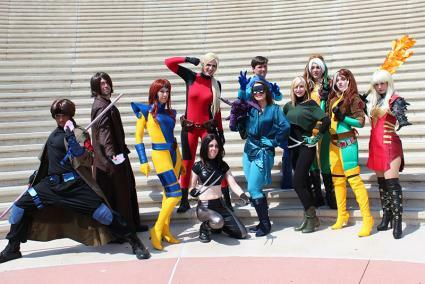 Whether you want to create a do-it-yourself X-Men costume or purchase a ready-to-wear option, you have numerous characters and costuming options. 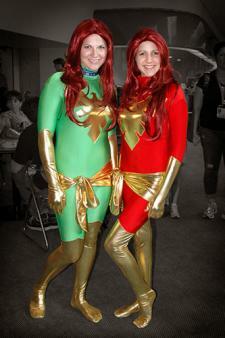 Jean Grey has worn costumes that are either gold and green or gold and red. Pick your color and then decide what style of costume you are trying to make. If you like the tight spandex look, a full-body leotard can help start your costuming. If you prefer a looser fit, any dress in the right color can be a great place to start. For a costume for children, look at ballet leotards to form the base for the costume. Jean Grey's gold boots extend up to her mid-thigh which makes this a challenging piece of the costume. While you can certainly find boots to purchase, it can be tough to find them in a specific size and they may be over $50 a pair. A shorter pair of gold boots that will work just as well. You can always re-purpose boots of another color by painting them with Liquitex Soft Body acrylic paint. The gold gloves can be found for purchase anywhere that sells accessories for formal dresses or at costume stores. Decide how long you want your sash to extend past your waist. Measure your waist and add that amount to the desired length. Decide how wide you would like your sash to be. This can vary depending on how thick your material is. You can test this by wrapping the fabric around yourself to see how if falls. You will probably want a finished length of 4 - 6 inches. Add 2 inches to the length and 1 inch to the width you have already determined. This will account for the knot and material lost in hemming the edges. Measure and cut your fabric to this length. One of the easiest ways to make the phoenix emblem is by using craft foam and paint. You can purchase craft foam in sheets or a larger roll. Trace the phoenix emblem onto your craft foam and then cut out the design. Craft foam is very absorbent and will soak up a large amount of paint. Apply Mod Podge to the foam to seal it prior to painting. Once your foam has dried, paint it with a gold acrylic paint. Apply varnish or another sealant to protect the piece. Attach to the front of your chest using either a hot glue gun or Velcro. If you want to go all out with the costume, an outrageous long red wig can complete the look. Inexpensive wigs can be found on Amazon, and higher quality wigs can be purchased from specialty shops. The older version of Professor Xavier (or Professor X) is bald, wears a suit, and uses a wheelchair. 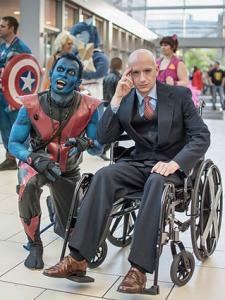 You can use a plain wheelchair or can add details to make it more closely resemble that used in the X-Men films. Xavier's wheelchair has four wide spokes on each wheel, a single flat foot plate, and a seat that more closely resembles an office chair in style. Cut out an x-shaped pattern for the spokes on card stock. Check the pattern against your wheelchair and then trace it onto cardboard. Paint the cardboard with acrylic paints. Attach the cardboard pieces to the wheelchair using Velcro or tape. You can follow the same technique to make the standard foot rests from a wheelchair look like one piece using a piece of cardboard or a thin piece of wood. You have two options for this: you can either shave your head or use a bald cap. Bald caps are made of either latex or vinyl and hide your hair. Use a product like Spirit Gum to tack down the edges. For a more realistic look, use makeup to hide the edges. The younger Professor has been shown in a navy blue outfit with a yellow central panel. Use a pair of wide black suspenders to approximate the vertical straps. Attach the extra suspender clips to help simulate the metal buckles on the Professor's harness. For the piece that crosses the front of the chest, cut an extra piece of the suspenders in the correct length for your body. Sew this piece to the two vertical pieces. Attach the hex nut to the front using a hot glue gun. It's a lot of fun to play a bad guy, and Magneto has a great costume as well. Start by finding a red bodysuit that fits you or you could wear red leggings and a tunic-length belted red top. You will almost certainly have to sew to create the costume. It is best to find a fabric that doesn't easily fray so that you won't have to hem every edge. To make the belt, you will need something to help it keep its shape. This can be an old belt with the buckle cut off, a strip of craft foam, or even card stock. Wrap your fabric over the underlying material and use a hot glue gun to secure it in place. Alternatively, if you are up for sewing, secure the fabric by stitching it into a tube around the pattern. Secure the belt around your waist with Velcro strips at the back. Alternatively, sew some material to tie the belt on at the back. This can be something commonplace like ribbon or shoelaces. You will have to make the mantle before you start the cape. Use craft foam to create the general shape in a similar way to the Jean Grey phoenix design. You should aim to make a half-circle shape with the flat ends at the tops of your shoulders. If you want a sturdier look, use multiple layers of foam and attach them with hot glue. To create the raised detail, find a common object of the right size (a gallon jug cap would work) and attach these with hot glue. Coat the entire mantle piece in Mod Podge or gesso to seal it. Lay out your fabric and figure out which edge is the longest. This will be the length of your cape. Find the midpoint of your fabric and mark this as the center of the back of your cape using pins. Using the midpoint as the center of a circle, mark out a semi-circle with a radius equal to the length of your fabric. Cut out your cape and hem the edges if necessary. Cut a small half-circle at the mid-point of your cape to create a curve for the neckline. Size this so that the edges of the half-circle match up with the edges of your mantle. Starting at one edge of the neckline, unfold a piece of bias tape and pin the fabric inside of it. Once everything is in place, sew the fabric and the bias tape together. Use a hot glue gun to attach the neckline of your cape to the top edge of the underside of the mantle. Make sure that you leave enough room so that you will be able to slip the entire piece over your head. Glue the front of the mantle to the shirt so that it won't ride up from the weight of the cape. Buy the gloves or paint an old pair of work gloves using a flexible acrylic paint. For the helmet, start by trying to find something with the right shape. This could be a plastic juice jug, a bucket, or a sports helmet. Clean the item and draw Magneto's characteristic facial opening onto the surface. Cut out the proper shape using either heavy duty scissors, a craft knife, or a heat knife (depending on your material). Once you have the shape right, paint your helmet using red and purple acrylics. If your item doesn't fit securely on your head, punch holes at the back and use a piece of string, elastic, or ribbon to tie it in place. 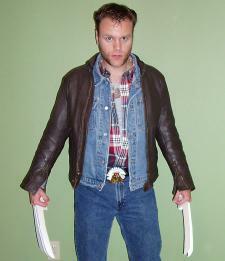 Wolverine is one of the most recognizable X-Men, and all you need to do to create this costume is to replicate his adamantium claws and add some of your own clothing to create the movie version of the character. Stick with something as simple as black jeans, a white tank top, and a dog tag to match the movie version of the character. If it's cold outside, you can add a brown or black leather jacket. Buy the claws to make creating the look simple. Rogue wears a flashy green and yellow outfit and boasts a white streak in her hair. For Rogue's belt, start with a thin brown leather one. You will have to make the buckle cover on your own and then glue it to the belt. Start with a piece craft foam and cut out the basic shape of the buckle cover (this can be a rectangle or a circle, depending on your preference for the costume). Seal the craft foam using Mod Podge. If the buckle on your belt is large enough, you can secure the cover directly to it with a hot glue gun. If it doesn't look like you will get a good fit wear the belt backwards and buckle behind yourself. Attach the buckle cover to the mid-point of the belt so that it will be on the front. The jacket is something that you can purchase. You may already have a similar jacket at home so go search through the back of your closets. Several outlets have wigs that feature a white streak. One simple way to create this look is to purchase a single clip-in piece that goes in with your regular hair. For a costume involving more dedication, ask your hairstylist to bleach that section of your hair. Rogue wears boots that extend to her mid-thigh, just like Jane Grey. Your options will be the same here -- either buy the tall boots or just work with something shorter. The final touch for this costume is a green hair band. You have several options for this piece - either purchase a small amount of green fabric, look through scarves, or see if you can find a hair band in the right color. Storm has several black outfits -- a couple that look like bathing suits and a skin-tight long bodysuit. There's also an all-white version. Typically, Storm also has black gloves, an emblem on her belt buckle, and white hair (long or short). 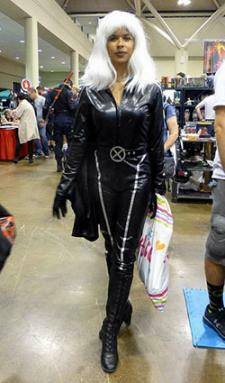 The easiest way to create a Storm costume is to find black pants (or leggings) and a black long-sleeved shirt that fit snugly. If you can find a shirt that has a little sheen to the fabric or that looks like leather that will be even better. If you are trying to match the costume from the films, use fabric paint to draw on the lines and shoulder details. You can purchase the gloves on Amazon. Create the emblem like the one for Rogue and glue to the front of the costume. Follow the same steps as the instructions for the phoenix emblem in Jean Gray's instructions. Several wigs can be found in whichever length you like. 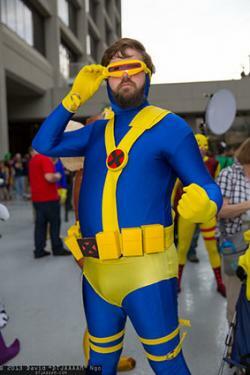 Cyclops' costume features yellow over a blue suit and a visor. To create this one, purchase a blue body suit and add the yellow details yourself. Use craft foam to create the yellow bands that pass over Cyclops' shoulders. Measure and cut out the foam to fit across your bodysuit. Paint the foam with Mod Podge and yellow acrylic paint. Once dry, attach to the body suit with hot glue. To create the yellow briefs, purchase a swim brief and wear it over the body suit. You can wear tall rubber yellow work boots or purchase a costume pair. For a final touch, purchase sunglasses that mimic the look of Cyclops' visor. 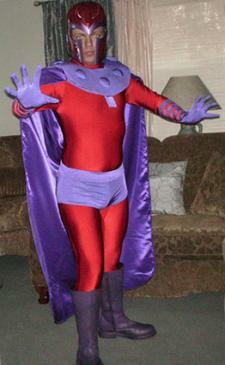 Mystique is a tough one to pull off, basically because your entire body is the costume. Everything - from your fingers to your toes, to your face is bluish-purple. You can take care of most of your body by purchasing a body suit with pre-printed spots or make your own. Add your own spotted design to the body suit using a fabric pen. For any additional exposed skin, you will need to use makeup or body paint. Apply blue and dark blue costume makeup on your face and neck with a brush or a sponge. If your body suit doesn't include gloves, it will be better to purchase these than to try to put makeup on your hands. Look for dress gloves (like for the Jean Grey costume). Try to find a pair of shoes in a matching color. If this isn't easy, you can buy dyeable shoes and have them dyed in whatever color you need. Jean Grey - Purchase a spandex version of this costume in either red or green. This costume includes the sash, gloves, and boot design. Magneto - For a quick costume that will capture part of this super villain's look, pick up this hoodie sweatshirt in red and purple. Wolverine - If you prefer to wear the blue and yellow version of this costume with the stripes on the flanks, raised shoulder pieces, and flared blue mask, you can purchase it for adults or children. Rogue - You may be able to find the entire classic green and yellow costume but it may be more expensive than other characters. For a more casual option, a t-shirt version is also available. Storm - Find the body suit and a cape in black, or the classic version with gold accents. Cyclops - The blue and yellow outfit can be purchased online, but you may want to pick up a nicer visor to complement it. In general it is easiest to buy some pieces and then add details on your own although you can do some DIY options from scratch. With a little creativity, some craft foam, and a hot glue gun --or your credit card and a great purchased option -- you will have X-Men costumes in no time at all.